More copies of All-Star Batman and Robin #1 were ordered by comics shops in July than any other comic book since 2003's Batman #619, also from DC — and more were sold in a single month than any comic book since Top Cow's Darkness #11 back in 1997, according to my analysis of the sales reports released by Diamond Comic Distributors on Aug. 12. Click to see the estimates for sales for July 2005. More than 261,100 copies of All-Star were ordered by retailers, outpacing all non-promotional-price releases since the end of the "Hush" storyline nearly two years ago. Actually, it's hard enough to parse Diamond's sales figures from 2003 that All-Star might be a brighter star, still. 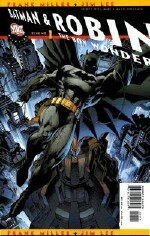 Diamond sold 235,000 copies of Batman #619 in September 2003 across both direct covers and the newsstand version, and then sold another 71,000 copies in October. But the order codes are aggregated, and the specific reprint order code from the special solicitation in Diamond Dateline appears nowhere in any of Diamond's charts. So it's hard to sort out what are true reorders for the original copies from the orders for the gatefold-less second printing, which shipped Oct. 22 of that year. Either way, All-Star had a stronger first month, and may yet surpass the total number of Batman #619s out there. The top-selling single issue before Batman #619 was Darkness #11, which had preorders of 357,000 copies across its 11 different covers. That issue shipped the final week of 1997. The top-selling DC comic book prior to 2003 was Superman: The Wedding Album, which had Diamond preorders of 346,000 copies in its November 1996 release. A contemporaneous Marvel peak could be found in the "Heroes Reborn" Fantastic Four Vol. 2, #1, which had preorders of 314,000 copies from Heroes World Distribution. The comic book with the largest print run of all time was 1991's X-Men Vol. 2, #1, with 7.1 million copies across five covers. A decent July. Thanks to All-Star and a strong line of new series launches, July sales of comic books and trade paperbacks to comics shops increased 3% over the same month in the previous year, keeping alive a year that's flirting with double-digit growth overall. Sales of comic books and trade paperbacks to comics shops have increased 8% in the first seven months of 2005 to $192 million. While July was slower than June — which had an extra shipping week — it nonetheless showed year-over-year increases in all categories. Retailers have been reporting strong rack sales, indicating high sell-through levels and bettering their bottom lines. Comics unit sales: The Top 300 comic books had retailer orders of 6.53 million copies in July, 6% more than July 2004, which also had four shipping weeks. Dynamite's Red Sonja #1 placed 14th, one of the highest debuts by an independent publisher since the 1980s nostalgia wave landed several smaller companies high spots in the early part of this decade. New publishers posting in the Top 300 included BuyMeToys.com, with its Oz/Wonderland Chronicles Preview landing in 233rd, and Boom Studios, with its Hero Squared #1 evidently placing in 236th. I'm saying "evidently" on that because of a typographical error in the charts Diamond sent out, in which that issue's order index number appears to have had its decimal point moved by one space to the left. Despite its order-index number being boosted by a factor of 10, the issue is ranked 236th, nonetheless, and Boom Studios is absent from Diamond's market-share list, where it might be, if the larger number was correct. If the larger number is the correct one, it would boost the month's sales by $100,000. Comics dollar sales: The Top 300 comic books had sales worth $19.03 million in July, 7% more than July 2004. For the first seven months of 2005, the Top 300 comics from each month have sold a combined $123 million, a 3% increase over the same half-year period. Trade paperbacks: The Top 100 trade paperbacks and graphic novels reported by Diamond had orders worth $3.47 million at full retail in July. Adding those to the Top 300 comics for the month yields $22.5 million, an increase of 6% over July 2004. For the first seven months of 2005, the Top 300 comics and the Top 100 trade paperbacks from each month had orders worth $149 million, an increase of 6% over the same six months in 2004. The July 2005 total was $28.96 million, which increases to $31.36 million, when Diamond's United Kingdom orders are added. The figure is up 3% over July 2005. Overall, the last seven months stand at $192.4 million, as mentioned above — up nearly 8%. Interestingly, July-to-July comics sales grew at a faster rate than July-to-July sales overall, suggesting that the lower backlist — the thousands of trade paperbacks that do not make Diamond's Top 100 list each month — wasn't where the action was for this month. There are a lot of high-octane events on the periodical side of things, and that may be drawing some of the new dollars away from the shelves and toward the racks. The overall category overstates comics' actual performance to the extent that magazines that do not have comics content are included. The comics publishers' market shares would actually be slightly higher, if ancillary items were removed. Market shares: Marvel led DC in Diamond's reported overall unit and dollar market shares, and that held true for each of the narrower calculations. DC had 98 comics in the Top 300 versus Marvel?s 80; and Image again posted a strong month, with 31 titles making the list. Dark Horse's strength continues to be in its backlist — coming in third in Diamond's overall dollar list, despite having only 14 comics in the Top 300, the same number as Archie. Price analysis: The average comic book on Diamond's Top 300 list cost $3.19, up from $3.16 in July 2004. The weighted average price — that is, the cost of the average comic book Diamond sold — was $2.92, up from $2.91 last year. The average price of the comics that made the Top 25 was $2.69, up three cents from July 2004.